Gareth Southgate is adamant that he heard chants in the crowd during his side’s Euro 2020 qualifier win over Montenegro. England's Danny Rose on the ball against Montenegro. 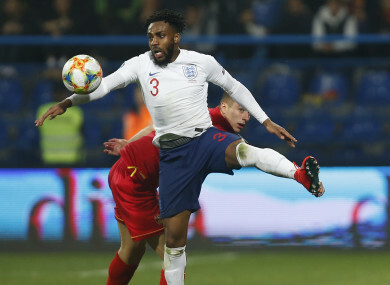 ENGLAND MANAGER GARETH Southgate is adamant that England left-back Danny Rose was racially abused by Montenegro fans during Monday’s Euro 2020 qualifier in Podgorica. I definitely heard it when Danny Rose got booked towards the end of the game. Email “'I definitely heard it... It's not acceptable' - England to report alleged racist abuse aimed at Rose”. Feedback on “'I definitely heard it... It's not acceptable' - England to report alleged racist abuse aimed at Rose”.